British design studio Claydon Reeves has unveiled its 70 metre concept that moulds a sculptural body around conventional interiors. The Caspian design, which was revealed at the Monaco Yacht Show, was developed from a ‘speed form’ – a simple model commonly used in the automotive industry to demonstrate surfacing techniques. The taut, clean design certainly shows its stylised beginnings. Caspian’s long lines extend from bow to stern, giving the appearance of length and grace, while its unusual planes play with the light. ‘A lot of the surfacing is concave, rather than convex, so you get these deep wells of highlight. It catches the light in a completely different manner to normal,’ says Claydon. This styling is reminiscent of the design duo’s work on the 80m concept Remora, unveiled at last year’s Monaco show. But whereas experimentation on that design extended to its interior – with a lobby rising two decks, an owner’s area on the bridge deck, guest suites aft on the main deck – Caspian’s sculptural exterior encloses a conventional layout. ‘We decided it would be nice to try and do a much more conventional interior, something more practical. We’re trying to push the exterior forms forward a little bit without putting people off,’ says Claydon. Caspian’s 95 square metre aft deck combines dining and lounging areas with a 7m long infinity pool which cuts through the transom and offers uninterrupted views aft. Beneath, the beach club has a bar and gym, while sundeck features a spa pool and sky bar. The main saloon reaches into the main dining room, and there is second lounge on the bridge deck. The owner's suite is situated forward on the main deck and enjoys commanding views from its full height windows. 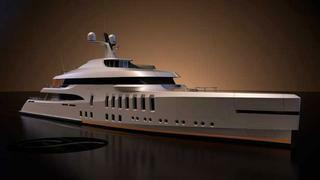 The yacht can accommodate 12 guests in four doubles and two VIP cabins and carries two 8 metre tenders. Caspian’s estimated range is 4,500 nautical miles at 15 knots.